In the beginning, Harbor General Hospital did not have a separate neurology department. Not long after the department of medicine was operating, Dr. Franz Bauer, the first chairman, arranged in the early to mid 1950s for visiting neurologists to come to Harbor and review cases presented by medical residents. These physicians, of course, were all in private practice and almost all donated their time. Although his name would suggest another specialty, Dr. Glenn Bonecutter, who graduated from the Indiana University School of Medicine, listed himself as a part-time specialist in Psychiatry and Neurology and was one of the first to participate. Dr. Kenneth Blinn, a graduate of the University of Nebraska College of Medicine, came to review patients during that time but mostly his effort was directed at reading the first of the electroencephalograms done at this hospital. Dr. Blinn was probably reimbursed for his EEG work and as such may have been the first Neurologist on the Harbor General Hospital payroll. In 1954 and 1955, UCLA was establishing a division of neurology with Dr. Augustus Rose as the first chief and Dr. Christian Herrmann as his first faculty. 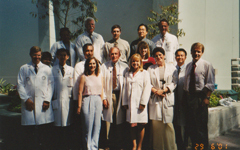 At that time Dr. Herrmann came to Harbor on a number of occasions to make rounds with medical residents. He recalls that these took place in the barracks and that the trip from Westwood to Torrance was even more arduous in those days before the freeway than it is now. Dr. Herrmann trained under Houston Merritt at the Neurologic Institute of the Presbyterian Hospital, Columbia University College of Physicians and Surgeons in New York and he retired from the university in the mid 1980s. At about the same time, in the mid 1950s, Dr. Johannes M. Nielson made rounds a few times at Harbor. Dr. Nielsen was one of the pioneering neurologists in Los Angeles County and original faculty at the University of Southern California School of Medicine. At the time of his attendance at Harbor, however, he was UCLA clinical faculty. This occurred as a result of a temporary falling out he had with USC during which time Dr. Rose seized the opportunity to obtain his services. During the late 1950s, Leslie G. Lloyd, who was trained at USC and also assigned to Long Beach VA hospital and later went to Beverly Hills to practice, came to Harbor to make rounds and also to read EEGs. Dr. Melvin Kaplan who was a medical resident at that time recalls that Dr. Lloyd often would take the EEG records home with him to read which sometimes meant tracking him down outside the hospital to find out the results. Of all the neurologists who generously contributed their time during the formative days of Harbor General Hospital, Dr. J. Paul Fitzgibbon was probably the steadiest and attended from 1954 through 1968. The fact that he and Dr. Franz Nauer and their families were close personal friends probably accounted for this. Dr. Fitzgibbon came once a week to Harbor and would rotate medical wards from one week to next and while here also participated in a weekly clinic conference. Dr. Fitzgibbon was an unusually interesting person. Though not a particularly large man, his other professional life had been as a lineman for the Chicago Bears Football team. He had thick white hair, was very distinguished looking, and is said to have a story for every occasion. Dr. McIntyre of the present faculty when assigned to Harbor General Hospital as a senior neurology resident in 1967 made rounds with Dr. Fitzgibbon and recalls seeing a patient with a peculiar movement disorder on the psychiatry ward. Dr. Fitzgibbon’s aphorism for that day was “If I haven’t seen it before, then it’s not of psychiatric origin.” It is rumored that Dr. Fitzgibbon practiced neurology with ever having done an electromyogram. 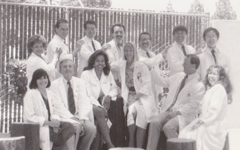 In 1962, the UCLA School of Medicine expanded its class and as a result Harbor General Hospital was called upon to play a substantial role in primary clinical education of the medical students. 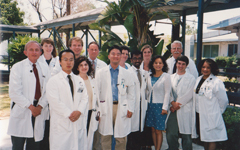 The UCLA Division of Neurology at that time was required to give a series of didactic lectures to the third and fourth year classes. These were to take place simultaneously for students at the Wadsworth VA Hospital, Univeristy Hospital in Westwood and Harbor General Hospital. As there was no neurology faculty at Harbor, the UCLA faculty, then about five in number, rotated the lectures amongst them. These were all held in the B-ramp conference room. It was not until 1963-64 that a full time faculty member was in residence at Harbor and that was in the person of Louis Rosner, who with his lame and braced leg, quick wit, and always noticeable vest provided a colorful beginning for the Division of Neurology in the Department of Medicine at Harbor General Hospital. Dr. Rosner did his neurology training at the VA Hospital in Houston, Texas and was on staff at the Neurological Institute of Columbia University before joining UCLA. In 1965, James R. Nelson came to Harbor as the first permanent neurology faculty and chief of the division of neurology. He had done his neurology training at the University of Washington in Seattle and then was stationed as a research neurologist at the Navy air station in Pensacola, Florida prior to taking the Harbor job. Dr. Nelson remained here through 1970 when he left to direct clinical neurology at the newly established University of California, San Diego Medical School. He has since gone into private practice in La Jolla, California. While at Harbor, Dr. Nelson was a popular teacher with the house staff. His research interest was in vestibular physiology and dysfunction. The Southern California life enticed him to take up surfing and golfing as early morning activities and from time to time he and Dr. William O’Dell, then Chief of Endocrinology and eventually Chair in the Department of Medicine, met for an early round of golf, after which they came to the hospital for showers, breakfast and then ward rounds. In 1968 Dr. Jon Dorman joined Dr. Nelson as the second full time faculty member in neurology. Dr. Dorman trained in Virginia nand then did a fellowship at the National Institute of Health with Dr. King Engel in neuromuscular disease and so broadened the division of neurology both at Harbor and at UCLA as a whole. In fact, he was one of the first neurologists specifically trained in neuromuscular disease to work in the Los Angeles area. In 1975, Dr. Dorman left for the private practice of neurology in the small town of Sonora, California. 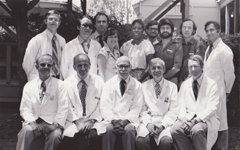 When Dr. James Nelson left, Dr. Mark Goldberg replaced him in February 1971. Dr. Goldberg obtained a Ph.D. in Pharmacology before obtaining his medical degree and trained in Neurology at the Neurologic Institute of the Columbia Presbyterian Hospital in New York under Dr. H. Houston Merritt. When he arrived, Jon Dorman was still at Harbor and in addition Dr. Hugh McIntyre was engaged full time as a NIH special research fellow and UCLA graduate student in Neurophysiology under the supervision of Dr. William O’dell. 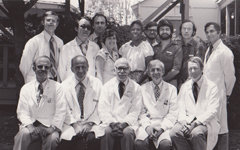 In 1972 Dr. McInture completed the fellowship and obtained a Ph.D. degree and was invited by Dr. Goldberg to join the Harbor neurology faculty; thus he became the third full-time faculty member in the department of neurology and the first full time director of the EEG laboratory. Dr McIntyre trained in neurology in the UCLA program under the direction of Dr. Augustus Rose and had his first experience at Harbor when as chief resident in 1967 he was assigned for a month’s rotation, two weeks of which were to provide Dr. Nelson with a much needed first vacation. During Dr. Goldberg’s period as division chief, a separate inpatient neurology ward and neurology inpatient consultation service were established and the Thursday afternoon neurology clinic and monthly multiple sclerosis clinic established under Dr. Nelson were continued. 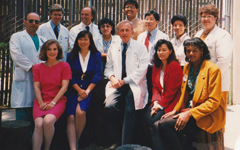 With the opening of the neurology ward, the Division of Neurology took the responsibility for the primary clerkship in neurology of approximately one-third of the UCLA medical students (which continues to this day). At that time, the housestaff in Neurology consisted of residents rotating from the Wadsworth VA program and the University Hospital program in Westwood as well as Harbor residents assigned from Medicine and Psychiatry. When Dr. Dorman left the faculty, Dr. Hugh Firemark was recruited to replace him and like Dr. Goldberg, Dr. Firemark also had been trained in Pharmacology. At the time of the Nelson-Goldberg transition, two other faculty appointments were of importance to Harbor General Neurology. 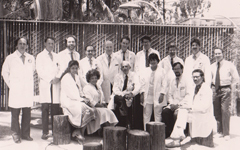 They were Dr. Marvin Weil in Pediatric Neurology appointed in 1968 jointly in the Departments of Pediatrics and Neurology of the UCLA School of Medicine and Hideo Itabashi, Neuropathologist, also trained in Neurology, and appointed jointly in the departments of Pathology and Neurology of the UCLA School of Meidince. Dr. Weil came from John Hopkins University and UCLA and Dr. Itabashi came from the University of Michigan. 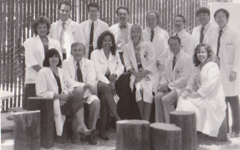 A second pediatric neurologist, Dr. Morton Weichsel, from Stanford University and the University of Colorado joined the faculty in 1974. This allowed the establishment of an educationally Handicapped Clinic and a Child Epilepsy Problem Clinic in addition to the General Child Neurology Clinic. 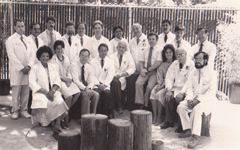 So by 1978 Neurology at Harbor was staffed by three adult neurologists, two pediatric neurologists and a neuropathologist and consisted of three clinical in-patient services, five outpatient clinics, a clinic lab and a vigorous teaching program which had been expanded in 1975 by the initiation of a Harbor based Neurology residency. This program admitted two adult and one pediatric neurology residents per year. Furthermore Dr. McIntyre began in 1972 training one post-doctoral fellow in EEG and neurophysiology. Also by 1978, Neurology had become a department at UCLA. The time seemed right for Neurology at Harbor General Hospital to become a free standing department, and this was supported by the Department of Medicine and the Medical Director. A search for a permanent chairman of the new department was initiated in 1979 and in 1980 Dr. Mark Goldberg was appointed to that position. 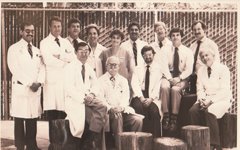 During the 1979-80 academic year, Dr. Hugh Firemark left the deparment for private practice. He was replaced by Dr. Thomas Anderson, joining the faculty in 1980, after having completed a fellowship in neuromuscular disease at Washington Univeristy in St. Louis, Missouri. For Dr. Anderson, this appointement was a return to home as he had been one of the early residents in the Harbor-UCLA Neurology residency program. This appointment brought back to the Harbor community that area of expertice that had been vacated by Dr. Jon Dorman. Since his appointment, Dr. Anderson has assumed directorship of the neuromuscular clinic supported by the Muscular Dystrophy Association both at the Westwood Campus and the Harbor Campus. Also he has established a separate teaching program in clinical electromyography. A pioneering activity of the new department of neurology was the establishment of a combined neurology-neurosurgery intensive care unit on ward 6W. This well serves the patient population at Harbor in that it contains a high proportion of acute and severe neurologic disease. This unit was extremely unique as such units were not present either at UCLA or at LA County General Hospital. 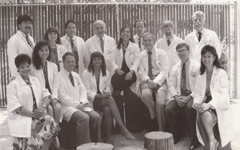 The Neurology Staff was expanded in 1985 with the addition of Dr. Bruce Miller. Dr. Miller, like Dr. Anderson, trained in Neurology at Harbor-UCLA and then went away for a fellowship. He trained in behavioral neurology and related neuropharmacology and since joining the full time faculty has initiated programs dealing with patients who have Alzheimer’s disease and patients who have late life psychosis. Dr. Miller eventually left Harbor-UCLA to work at UCSF, where he is currently the Professor of Neurology and Psychiatry and he holds the A.W. & Mary Margaret Clausen Distinguished Chair. Research in the Department of Neurology has included contributions in the fields of pharmacology of antiepileptic drugs, the management of epileptic patients, clinical electroencephalography, neural control of pituitary function, neuroimmunology, developmental biology, mechanisms of alcoholic myopathy and neurochemistry of Alzheimer’s disease. A significant medical contribution has resulted from the department’s experience with cysticercosis of the nervous system.